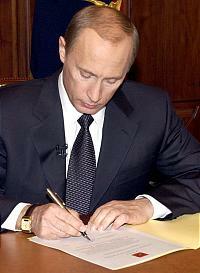 President Putin signing the order dismissing Prime Minister Kasyanov on Tuesday. The stock market and the ruble briefly tumbled on news that President Vladimir Putin had sacked Mikhail Kasyanov as prime minister amid fears that the unexpected move could signal a return to the government upheavals of the 1990s. But investor jitters soon steadied on hopes this was merely a demonstrative pre-election show of strength by a president keen to shed one of the last major holdovers in his government from the Boris Yeltsin era and an official viewed by many as being too close to big business. Stocks recovered from an initial drop of 3 percent to 5 percent, and the RTS index closed 1.41 percent down at 647.61. The ruble fell 4 kopeks in afternoon trading. Most market watchers and business people had predicted Putin would fire Kasyanov after his widely expected reelection on March 14. So the dismissal ahead of time, they said, just caught them unawares. The appointment of Deputy Prime Minister Viktor Khristenko, who is largely seen as a liberal technocrat, as acting prime minister until Putin forwards a new candidate also steadied nerves. "For a moment, it felt like a return to the past when there was a new prime minister every month," said James Fenkner, head of research at Troika Dialog. "It was a knee jerk reaction. But then people began to think about it and realized it was not so bad." Other foreign investors applauded Kasyanov's dismissal as a vote winner that would help distance Putin from an official associated with the chaotic wealth grab of the Yeltsin era and one who could be blamed for the government slowdown on some reforms. Kasyanov also had earned Kremlin ire by openly breaking ranks with Putin in criticizing the legal onslaught against Yukos, a battle seen by many as key in establishing greater state control over big business. "Essentially Putin has realized how popular it is to clean up the excesses of the Yeltsin past," said William Browder, director of Hermitage Capital Management, which manages some $1 billion in investments in the Russian stock market. "If anything, [Kasyanov] was standing in the way of Putin's reform program. "He was compromised by his role in the Yukos affair, and that made him deadwood for Putin," he said. Observers have criticized Kasyanov's government for stalling on key structural reforms needed to reduce the country's dependence on raw materials, accusing it of being unwilling to make moves that could undermine powerful vested interests. One such long-stalled reform under Kasyanov is administrative reform to cut back the country's bloated bureaucracy. In an interview published in Noviye Izvestia on Tuesday, presidential economic adviser Andrei Illarionov lashed out at "Kasyanov and Co." for not doing enough to speed up growth and relaxing on a cushion of high oil prices. But despite the removal of a prime minister seen to be slow to act against big business, some wariness remained among investors over why the shakeup had come so suddenly and over the person who Putin could eventually present as his preferred candidate to head the next Cabinet. Khristenko could just be an interim figure, they said. "This still leaves some uncertainty over who the candidate is going to be. The market would take it badly if Putin appointed [Defense Minister Sergei] Ivanov. The big question for the market is still the reform agenda after the election," Fenkner said. Ivanov, a close confidante of Putin from St. Petersburg, has been widely viewed as a possible prime minister, along with liberal reformer Alexei Kudrin, the finance minister and a deputy prime minister. Ivanov waded into economic policy in an interview with Kommersant toward the end of last year in which he called for state control over strategic sectors of the economy, including oil. Kasyanov, however, was seen as one of the key protectors of big business in government. A former finance minister in Yeltsin's government, Kasyanov first came to the fore as a skilled debt negotiator. His behind-the-scenes debt dealings in the mid-1990s earned him friends in high places and the nickname "Misha 2 percent" amid accusations he parlayed insider information on the debt market into his own financial gain. A crusading Yabloko deputy, Viktor Gitin, who had spent years gathering a library of information on Kasyanov's alleged misdoings in debt deals, ended up in jail on fraud charges shortly before Putin appointed Kasyanov his prime minister. Gitin was soon freed, but his archive of documents was confiscated and never returned. Kasyanov also was seen to openly lobby for the interests of Sibneft owner and Boris Berezovsky protege Roman Abramovich. One of his first deeds on becoming acting prime minister was to persuade the Ukrainian government to privatize its Nikolayev alumina plant, which then became a key part of Abramovich's Russian Aluminum empire. More recently, he spoke out sharply against the legal attack on Yukos, which has led to the jailing of its founder Mikhail Khodorkovsky on charges of large-scale fraud and tax evasion. Many see that battle as Putin's response to the oil baron's political and economic ambitions and as key in trimming the powers of the oligarchs who once freewheeled through the Kremlin. In July, after the arrest of Khodorkovsky ally Platon Lebedev and even though Putin had openly called for the Cabinet to keep silent on the affair, Kasyanov said the case was ruining the investment climate. Many analysts took those remarks as a sign that Kasyanov was taking the side of the oligarchs in a battle pitting big business against conservative Kremlin hawks known as the siloviki, who aim to take greater control over the economy. Since then Kasyanov has kept a lower profile amid widespread speculation Putin would fire him in his second term. In a rare departure from recent kowtowing to the Kremlin, big business representatives warned Tuesday that Kasyanov's dismissal could strengthen the hand of the state. "The main thing now is not ... to fall under the temptation of introducing greater state regulation and interference from the state in the economy under the guise of greater social responsibility," said Igor Jurgens, the executive secretary of the big business lobby group, the Russian Union of Industrialists and Entrepreneurs, or RSPP. "The main thing is that there are no steps backward and steps to organize the prevalence of the state over business, which can be seen in the statements of some state officials," he said, Interfax reported. RSPP chairman Arkady Volsky said the sacking would have a direct impact on the dealings of the lobby group. In a sign he considered Khristenko to be a close protege of Kasyanov, Volsky said Kasyanov could not be considered out of the job just yet. "If there's another appointment in a week, then it would be possible to say that Kasyanov has been removed," he said, Interfax reported. Yukos co-founder Leonid Nevzlin, who is now in exile in Israel but wanted in Russia on fraud charges, lauded Kasyanov for his stance in opposing the attack on Yukos. "I was always and still am thankful for his unwavering position on the Yukos affair, which he always saw from the point of view of the loss it was bringing to the economy and to the politics of the country," he was quoted by Interfax as saying. Analysts said Kasyanov probably knew his days were numbered in government and could have been using the last few weeks of his time as prime minister to put a spoke in the wheels of government moves to take greater control over big business. That could have provoked Putin's sudden decision, they said. "Kasyanov knew he was heading for political retirement," said Roland Nash, head of research at Renaissance Capital. "He was probably spending the last two weeks doing the most active lobbying for his post-PM future. It could have been his last bid in government to protect the interests of big business." Kasyanov's spokeswoman Tatyana Razbash, however, denied he had been engaging in any such activity. Others, however, pointed to a decision by Kasyanov just last week to postpone a key Cabinet meeting that had been scheduled to discuss a planned tax hike on the oil sector, among other tax reforms, as a sign he was openly acting on behalf of big business. Alexander Shokhin, a former deputy prime minister and current chairman of Renaissance Capital's supervisory board, said Kasyanov's inaction on the Cabinet meeting could have been the final straw. "The prime minister should have shouldered the responsibility in making a decision [on the tax reform]," Shokhin said, Interfax reported. "However he postponed the discussion of this question until after the elections, having clearly decided not to take any risks. "I think this could have determined the decision of the president to a large extent," he said. Other observers feared that Putin's abrupt shakeup was a sign he was losing control. "Why does Putin have to do this now when it would be more natural to do so after the elections?" said Anders Áslund, an economist at the Carnegie Endowment for International Peace. "It looks like the situation is moving out of control for Putin. This is self-destruction." Boris Berezovsky, the businessman and fierce Putin critic, echoed that. "The country's leadership is acting nervously and impulsively," he said by telephone from London, where he has political asylum. "And just hear the explanation [for Kasyanov's removal]. It is laughable. Is there really nothing Putin's administration can say about what has been done and where the country is going to have to get a new Cabinet?" he said. Staff Writer Valeria Korchagina contributed to this report.